Your Northeast Grange Lecturers have been hard at work. I have just returned from a meeting with what I consider good news. We are in the midst of putting a Program Help book together which will be mailed to all Lecturers in the Northeast as soon as all the information is in and gets printed. You may even have received it already. If not, watch your mailbox for it. As you probably know, it was announced that there would not be a Northeast Lecturers’ Conference in 2018. This is still the case. However one is being planned for 2019. It will be held in Massachusetts. This should be a shorter, more convenient travel for us here in Connecticut. The Title of the conference will be “Down on the Farm”. Don’t be fooled by this title. Do you eat? Do you knit or crochet with wool yarn? Do you sleep between cotton sheets? None of these things would be possible without the farmer. The conference will take on a new look with things being done differently. Suggestions that people have made have been incorporated into the schedule. As I get more information I will get it out to everyone. As the March winds blow, our Grange activities escalate. It has been a bad winter for lots of Granges as the weather just didn’t seem to want to cooperate with us. Meetings have been cancelled with just special meetings held to pay the bills and act on other important matters. It still seems strange not to have been holding Pomona meetings this winter. As our new Pomona Granges get started we all need to be on hand to give them the help needed. I know who two of the Lecturers are and know that they will give their all. This will be a new experience for all three Pomona Lecturers. They will want to keep all the Granges in their Pomona involved, but won’t be that familiar with the people in some of their Granges. PLEASE VOLUNTEER TO HELP THEM! Don’t forget that the “A Number” and Talent Contest entries go directly to State for judging. Every Grange should be able to do an “A Number”. The title should have something to do with a Vacation. It can be a good vacation, a bad vacation, a funny one or a serious one. Any number that can be used for a Grange program is eligible. 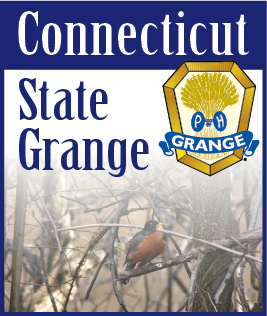 This year’s contests will be held at Cheshire Grange Hall on Sunday, June 10, beginning at 1:00 p.m. sharp. I will be asking everyone to give me the names of their entries. See you around the State.